You can learn many lessons about being an adult from a teenager. This teen may even be a better adult than you are. 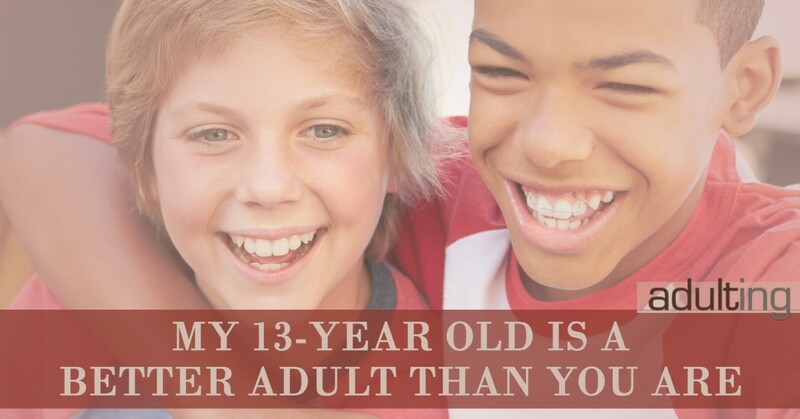 According to society and government, once you reach age 18 you are considered an adult. You can make your own decisions and sign legal documents. But just because you are a certain age, does that make you an adult? While you might technically be an adult, the actual act of adulting is a little bit harder. Functioning as a successful adult requires more than just turning 18. 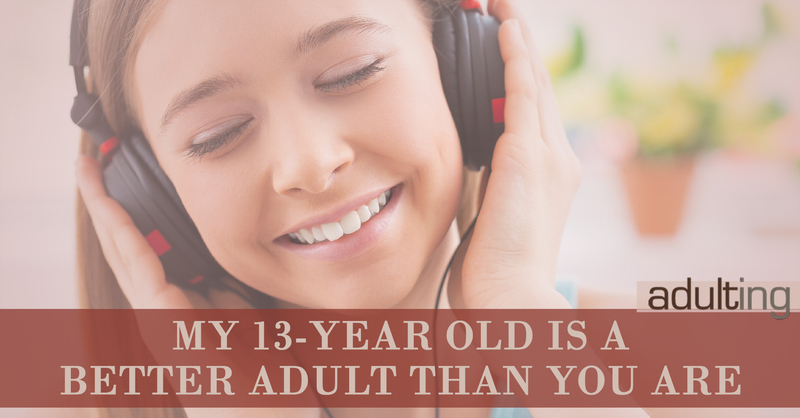 In fact, as I look at some of the things so-called adults do (or don’t do), I realize that there is a lot that 21-year-olds can learn from my 13-year-old son. Hell, there are probably some days that my son is actually a better adult than I am. Here are some of the life skills that my 13-year-old excels at, and will help him when he becomes an actual adult. If you want to be a better adult and more successful in life, time management is key. We all have days when we don’t want to get something done wrong we have a hard time getting a handle on the clock. The idea, though, is to do our best to plan ahead so that we can manage our obligations. A couple weeks ago, my son and I were talking about our after-school day. I reminded him that I had a meeting to go to and that he would be on his own after dinner. He mentioned that he knew that he would need help with his homework and suggested that we tackle the homework first, before he practiced saxophone. Rather then springing the homework on me after I returned from my meeting, he thought ahead to all of what he needed to do that afternoon and took the initiative to make sure he had time for all of his obligations. Sometimes we just run out of that time and we have to choose between different activities. That’s just life. Adulting is recognizing that sometimes you do have control over your time, and making sure you prioritize what is most important. Do you have to be told what needs to be done? We only need direction sometimes, especially when we’re learning something new. However, if you want to be a better an adult you need to recognize that sometimes you just need to do what needs to be done without being told. My son comes home from school and knows he needs to take care of certain things. He has music practice, fencing practice, and homework. I don’t need to tell him to get started on these things; even on days he doesn’t necessarily want to get going, you still getting started even if I’m not home too tell him to do so. After I broke my wrist my son really stepped up, keeping track of when he needed to start the laundry and paying attention to what time to start dinner. In many cases, he saw would need to be done and went ahead and did it. We all like junk food. I’d rather eat cake than make a salad. However, I know that macaroni and cheese for dinner every day and over processed foods aren’t good for me. So I don’t make them very often. My son is learning how to be a better adult by making better food choices. When he make dinner, he includes a fruit and vegetable in addition to whatever the entrée is. He helps with cooking, and is capable of reading a recipe. Thanks to Blue Apron, it’s possible for him to see you what we plan to have and get step-by-step instructions on making a nutritious dinner. Maybe it’s because I write about money, but my son is already learning habits that many 20-somethings I know don’t have down. I recently got him a debit card, and he is very good about tracking his spending. He also takes the time to think about what he wants to buy with his money. He almost most never makes an impulse purchase because he had a clear idea of what he hopes to use his money for, and the knowledge that if he uses his money on something today he won’t be able to buy something else tomorrow. He’s also learning to give money to charity and set aside money for the future. He follows the stock market because he is investing in an index fund with his long-term savings money. Finally, he’s constantly thinking of other ways to make money. He works hard and his 4-H projects so that he can earn ribbon money, and he helps out with administrative duties in my home office. He also has big plans for a YouTube channel and other online ventures. We’ll see if he follows through with any of them. Obviously my 13-year-old is not ready for many of the responsibilities associated with being an adult. But he’s got a pretty good handle on things. What do you think makes an adult? Are there some things that you see so-called adults doing that aren’t very adult-like at all? How are you trying to be a better adult?